How to install Portworx PX-Developer onto a DC/OS cluster running on vanilla AWS EC2 nodes. This post is about why you would want to do that and how Portworx can help you run your mission-critical stateful services on Mesosphere DC/OS. We’ll start with some background on Mesos, Marathon and DC/OS. Feel free to skip that if you are already familiar. Consumer-facing services like Siri and Twitter run at unimaginable scale, and deployments often involve thousands of compute nodes. A battle-proven, enterprise-grade solution to orchestration at this scale is Apache Mesos. It pools compute nodes and makes them available to pluggable frameworks to use when deploying workloads. Marathon is a Mesos framework that will schedule Docker containers onto your cluster of compute nodes. This frees up developers to concentrate on their Dockerfile and Marathon will think about what compute node to run the container(s). DC/OS is a packaged version of Mesos and Marathon (along with other tools) developed by a company called Mesosphere. It has a GUI and CLI to make the operation of a Mesos cluster running Marathon easier. DC/OS includes an app-store of services that you can install with a single command called Universe. Portworx is available in the Mesosphere Universe. We’ll see how to install it below. The Mesos/Marathon stack will work great if your entire workload is stateless (perhaps a Twitter bot or a Google Maps api client). Quite often though, there is a process or two that will require persistent storage (perhaps a Postgres or Redis server). Following the 12-factor manifesto we could run our stateful services as pet’s not cattle and install them on single-purpose static servers. This seems like a shame, we have the full power of an industrial grade container scheduler but still have to manually operate some of our stack. What if we had a tool that treated our heterogeneous compute cluster as a heterogeneous storage cluster too? Portworx storage offers a container aware storage fabric that will run on a commodity cluster of compute nodes. Because Portworx storage offers replication – we automatically have high-availability for our Postgres, Redis, MySQL or otherwise stateful container (if the container lands on another node – Portworx storage will ensure the data is there). We can also take snapshots of existing volumes and then run other workloads against the snapshot volume. For example, we could easily run a test-suite against a snapshot of production data only a few seconds old. Mesos plays the role of the kernel in our cluster and Marathon that of the init system. This allows us to treat a cluster of many nodes as one large computer. Adding Portworx storage to this cluster means we now have a unified storage layer. It knows where containers are and what volumes they need. It will get the data volume in place before the container starts and constantly replicate data to other nodes without the container needing to know. Unify your entire stack and deploy stateful containers alongside stateless processes to the same cluster using the same orchestration framework. NOTE: you can skip this step if you already have a working aws command with configured access credentials. Make note of the region you choose – for example this demo will be run inside eu-west-1. You can get your AWS Access Key ID and AWS Secret Acess Key from the Security Credentials page of the AWS console. Also – you will need to create a key pair in the region you will run your stack. Now we will use cloud formation to launch a DC/OS cluster with 1 public and 3 private slaves. Use the cloud formation template – and pick the single master configuration and the region you created/have a key pair for. Review the details and make sure you click the AWS::IAM::Role box at the bottom before you click Create. The stack will start spinning up – it may take up to 10 minutes, you can keep an eye on the progress using the CloudFormation screen. On the bottom left you will see the installation button for the DC/OS CLI – install this onto your laptop. First we clone this repo so we can use admin.sh and the Marathon manifests. Portworx requires a shared mount namespace setting for versions of Docker before 1.12 – this is so it can mount block devices from inside a container. Also, we need a block device on each node dedicated to container storage. Let’s check that the block devices were attached. Portworx requires a key value store like etcd or consul so it can co-ordinate cluster state. Also – so we can see our application from the outside world – we need to install marathon-lb – a layer 7 load-balancer. We will use the dcos cli to install both services onto our cluster. Wait for the etcd-server tasks and marathon-lb tasks to be running. NOTE: in future, etcd will be installed automatically alongside portworx. So the Portworx storage agents know where the etcd server lives – we need to pass a configuration file that includes the endpoint of the etcd server we just installed. Wait for all 3 portworx tasks to be healthy. Now load the application in a browser and create some state. To simulate HA failover of our application container AND it’s data – let’s do a sneaky docker rm -f for the container. Notice the DC/OS dashboard notice and re-schedule the container. Let’s check the node the px-counter app is running on. Repeat the kill-app-container until you can see the container has landed on a differnt node. Now reload the URL in the browser and magic – our data is still there! Now we create a snapshot of the volume so we can run a CI test against it. Now create some more state in the production application in your browser so our production data and app-ci-test snapshot have diverged. The test we ran should have added one more logo to the top-left of the screen. This is an example of running a test-suite safely against production data! 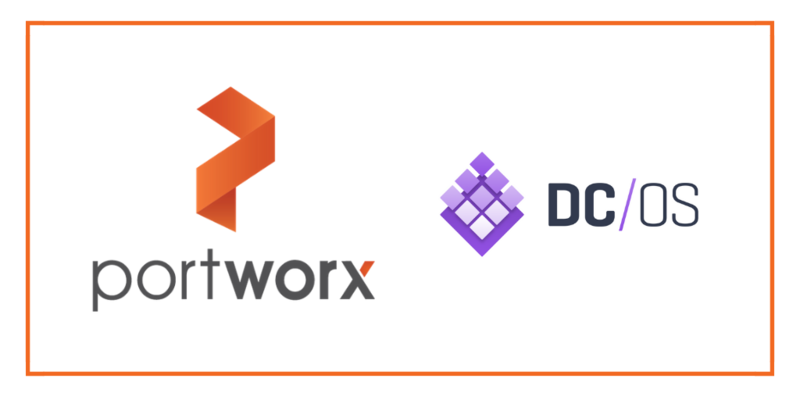 In this blog, we saw how to deploy and run Portworx via DC/OS Universe. In the next blog post, we’ll look at a real world scenario for running Cassandra in production using Mesos, Marathon and Portworx. Did you enjoy what you just read? Learn more about Docker, Kubernetes or DC/OS storage.